There are two types of people in the world; those who are unprepared when their car strands them with a common ailment, and those who pack a few smart items in their trunk for emergencies. Which are you? Anyway, the first two are what we’re here to discuss today. Specifically, being prepared for emergencies with your vehicle and helping people in need of automotive assistance. 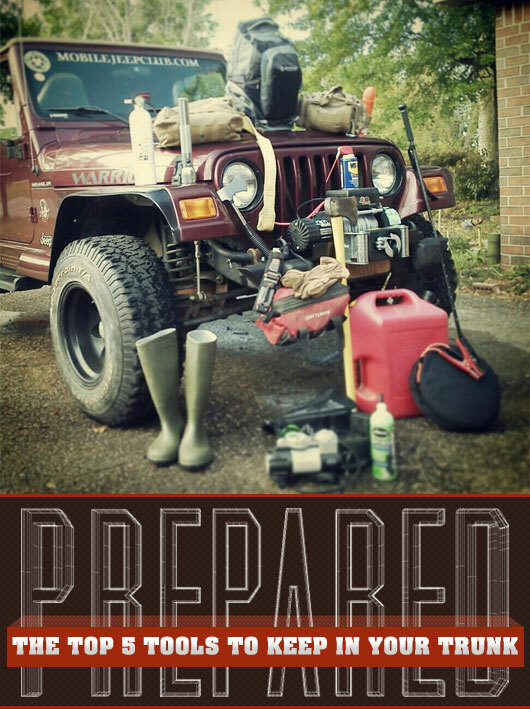 The picture above is of my Jeep and the supplies I carry on a daily basis. I’ve used everything at least once (except the fire extinguisher) and, although it may look ominous, there are no weapons, just tools. Yes, there is a knife, an axe, and a hatchet, but those are tools. While you may never need an axe, rubber boots, and paracord (jeez, when I type that out it sounds very serial killer-esque), at some point you will most likely find yourself with a dead battery or flat tire. The list below contains important items that everyone should carry in their vehicle in order to always be prepared and to help someone in need. All of these items are available at your local Wal-Mart, Sam’s Club, Costco, eBay, or Amazon. The Big Five: These should be at the top of your list. These should really come standard with every car. In a perfect world, they would just be free. You’d go to renew your car tag and the clerk would say “Ok, here’s your new registration, and do you need a set of jumper cables for the vehicle?” Unfortunately, it is not a perfect world. Having a dead battery in a crowded parking lot and not having jumper cables is the 21st century version of The Rime of the Ancient Mariner “Water water everywhere nor any drop to drink”. Instead of wandering aimlessly around the parking lot hoping in vein that you find someone who does have cables that you can borrow, keep some in your trunk. Then, all you have to do is find someone with a battery! Cables are pretty universal and very easy to use. Don’t get any that are less than 10ft in length. I’ve never had an issue with cables being too long. Most cables these days come with a storage bag and instructions too. 90% of the tires I have changed have not been my own. Often, they belong to people who have absolutely no idea what they are doing, and are literally two mistakes away from killing themselves. 50% of those people do not have suitable spare tires. Enter the flat repair kit. This is not a cure all replacement for a proper spare tire, but it can save you, or the person you’re helping, from having to leave their vehicle somewhere unsafe or have it towed. Flat repair kits with an air pump range in price from $19 for a cheap, but good, kit for small passenger cars, to $65 for a kit with a much larger (faster) air pump designed for trucks and SUVs. My brand of choice is Slime. I keep the $65 kit in my Jeep and will be adding one to my wife’s truck very soon. Slime kits come with a 12v air pump that runs off of your cigarette lighter (if that doesn’t work you can get an adapter that allows you to connect to the battery. Check the automotive electrical section or Radio Shack) a container of Slime goo, and instructions. The more expensive kits come with tire plugs and tools to remove nails and plug the holes they leave behind. You can always use a bigger pump on a car tire. It will just inflate it that much faster. 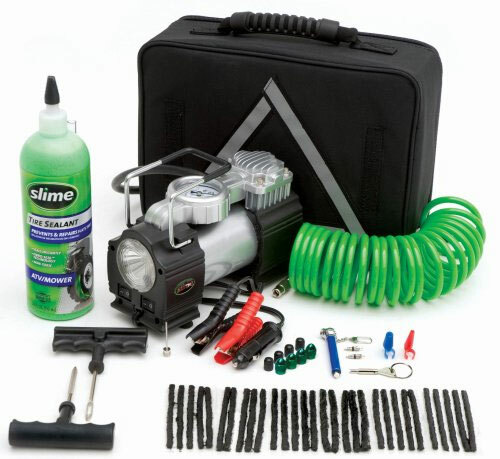 If you have the money to spend on it, or you often find yourself needing an air pump, buy the Heavy Duty Flat Repair Kit from Slime. I promise you won’t be disappointed. The real advantage that these kits have over aerosols like Fix-A-Flat is that they are reusable. Sometimes, your tire just has a slow leak. Instead of dropping a buck at the gas station, bust out your air pump. They also work on most bicycle tires and many come with needles for inflating sports balls. I probably don’t need to explain these much. Everyone needs a bandage from time to time. Maybe you twist your ankle while shooting hoops with your bro’s, or your child gets a splinter while doing whatever it is that kids do to get splinters. 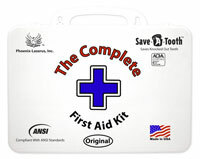 Having a small first aid kit in your vehicle just makes small boo-boos that much more manageable. If you are more comfortable in your first aid abilities, or find yourself on adventures away from civilization, consider investing in a more extensive kit. You never know when you might come across someone in need, or need help yourself. What’s in that little box could mean the difference between life and death in some instances. Here’s my required disclaimer: You should always help someone in need, but don’t do anything that you aren’t 100% sure will help them. It’s a true fact of this sad life that people can sue you for trying to help them. If you can get 911 on the phone, follow their instructions the best you can. I have only ever seen one car catch on fire. We were traveling home on the interstate one night and, all of a sudden, the vehicle in front of us had a fire ball underneath it. We turned on the strobe lights and pulled them over. Did I mention I was driving a police car? No? Well, that’s another story entirely. Anyway, we pull them over, and while I get the obviously confused older couple out of their car, my partner grabs the extinguisher from the trunk and proceeds to empty it out under their vehicle, thus saving the day. Had we not been there, and had we not had the fire extinguisher, there is no doubt in my mind that those people would have died, or at least been seriously injured. 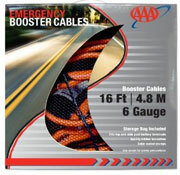 Keep one in your vehicle, and keep it somewhere that you can easily access in an emergency. If you have to use a key to open your trunk no matter what, that’s not a good place. Look for one of the smaller spray can models that will fit in your glove box or under the seat. If you have room, go for one of the 2lb models that are rated for auto and marine use. It is also important to check your extinguisher and make sure that it is charged. I check the one in my Jeep on the first of the month. It takes 2 seconds to look at the gauge and it gives me a little extra piece of mind. Once it’s dark, it’s dark. And it’s going to stay that way for a while. Keep a small flashlight in your vehicle for the dark times. They make anything you have to do to a vehicle at night easier. They can also help you signal for help. I prefer LED models and you can usually find them for next to nothing at Harbor Freight. Often times, if you get a coupon in their flyer, they are free! Get 2 or 3 and keep them in the glove box and trunk. If you want something more substantial, and have $25 or $30 to spend, you can’t go wrong with a 2 or 3 D-cell LED Maglite. There is a reason they were used in the law-enforcement world for so long. I’ve had the same Maglite for almost 15 years, and just upgraded to the LED bulb last year. It has been dropped more times than I can count, and run over twice. These things are just unstoppable. If you still have room in your trunk, consider picking these items up as your spending money allows. Gas can $10: Helpful if you’re out of gas and roadside assistance is hours away. 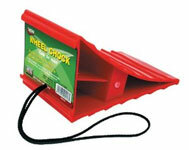 Wheel chock $4: Use this for added safety when you’re changing a tire. 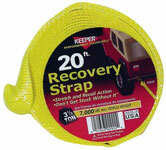 Tow strap (not one with metal hooks attached) $20: This $20 and a helpful passerby can save you hundreds in tow truck bills if you become stuck in a ditch, in the sand, or in the snow. The ones with metal hooks attached are generally weaker and the hooks can become projectiles. Stick with a strap that has loops at each end and buy a D-ring from Tractor Supply Company or eBay if needed, to allow you to attach it to your tow points. Every vehicle has them, consult your owner’s manual for your specific locations. Old towel or beach blanket $0-$10”: Sit on it instead of the ground while changing tires. Your pants will thank you. For those of us in climates with winter, always be sure to pack some winter gear (gloves/hat/spare jacket?) when the seasons turn. I always carry a warm blanket in my trunk during wintertime, it was a life saver one time when my car broke down and I had to wait it out. I keep a headlamp in each of our cars. If you’re having to change a tire or tinker under the hood at night, it frees up both of your hands. Also a good point on the spare tire. Whenever you have your tires rotated/balanced, or you’re adding air, make sure and check the spare. A leaky spare that’s been sitting there flat for 8 years does you no good when you blow another one out. A fire extinguisher is my number 1! this is perfectly timed, b/c I just bought a 1985 Bronco and was planning on visiting Autozone to pick up some stuff and ask what tools I need to keep in it. I was also told to keep needle nose pliers and extra fuses in the car b/c in older trucks/cars, they tend to burn out quicker. I’d also add a tire gauge to the list. Something else to keep in mind with the Slime or Fix-A-Flat is that they are often temporary fixes and many tire shops will not patch a tire that these compounds have been used in. I tried once and ended up having to buy a brand new tire instead of paying 10$ to patch it. Great point Matt. If you carry a road hazard warranty, check with your specific tire shop to see if it will void your warranty. Mine is through Pep Boys and they told me specifically that Slime would not void my warranty. Buy the pump and plug kit, learn how to use it, and you should be good to go for 98% of tire problems. The most essential items, however: Your golf bag and a fishing rod. You just never know when you’ll have some spare time. You forgot a breaker bar and 30″ pipe to use as leverage to loosen the damn lug nuts. You’re right. I’ve got a 4 way tire iron that I keep in my trunk just got that reason. Another thing that’s a good idea to have for roadside fixes: A blanket. Put it down on the ground roadside to preserve your clothes, if a flat or something happens, chances are you’re not going to want to get your clothes all dirty. Also serves a dual-purpose as a nice picnic blanket for those date nights in the park. Just bought a used Land Rover for $3,000 (my first car). The guy threw in over $1,000 worth of this kind of stuff in it! I tried to give it back, but he insisted that I keep it… go him! That’s awesome! I’m curious what year it is, that’s a crazy price! Very cool! I’m interested in some details too. Just a heads up, in my experience they can be unreliable, but that has never stopped me from buying a vehicle I wanted 🙂 Start reading some owners forums to learn common issues, pick up a Chilton’s manual, and start getting your fingers dirty, and have an awesome time with your new ride! I would also add some water and granola bars. Hopefully it will never happen, but you never know how long you could be stuck somewhere or how far you will have to walk to a service/gas station on a long trip. Maybe some coolant for your radiator too, or you can use water the water if you have to. this is all good and all, but it will take up a lot of space! Not as much as you would think. The compressor kit is smaller than a phone book. The jumper cables are about the size of a standard to-go box. The first aid kit I carry is about the size of one of those old 80’s lunch box’s with your favorite cartoon on it, but many are small enough to fit in your pocket. A small LED flashlight will fit anywhere and the fire extinguisher can probably go anywhere you want with enough cleverness. Maybe Velcro it under your passenger side dash? Good idea about the fire extinguisher, though I’d try to secure it under the driver’s seat. If there’s a fire, I’d want the extinguisher within easy reach, instead of unlocking the trunk and sprinting halfway around the car to get it. Along the same vein, I always keep a multi-LED flashlight in my glove box: D-cell-sized, bright, cheap, and sturdy enough to drop on concrete without worry. Flash lights are great to have in the car except for the fact that extreme heat and cold will ruin your regular alkaline batteries and your flashlight won’t work when you need it to. Spring for the lithium batteries that are designed for cameras, they will withstand extreme temperatures. Needle nose pliers are another one for sure. You probably won’t be able to use that tire plug kit without it if a nail is stuck in the tire and you can’t pull it out with your bare hands. Also it lets you cut the excess tire plug material that stays outside the tire. Oh and a lighter is a great idea too. It’s a good idea to hit the outside of the tire plug with the lighter to melt things together a little bit. Also useful if you need to build a fire to keep warm or burn your car down to hide evidence. Great advice! I wear dress slacks and shirt when going to work so I carry coveralls for in case I have to change a flat on the way. I would add the basic pliers, needle nose pliers, crescent, multi-tip screw driver kept in a zip up bag. Always have some extra fuses with various amperages for the under dash fuse panel. You car lights and various other elecronics can go out without warning due to one of those fuses blowing. You should try out this lightweight easy to carry concentrated water powder – just add water. Philips and flathead screwdrivers, and an adjustable wrench. That’s pretty basic. Also a 1xAAA LED flashlight that you can hold in your mouth or clip to a hat while working in the dark.